This easy keto chicken salad is a staple for me, it’s tasty and super fast to make. It’s made out of wholesome ingredients that are very nutritious and good for your body. I’ve never been a huge fan of salads. I’m trying to include them in my daily meals so that I can get all the nutrients and fiber my body needs. Eating super low-carb/ ketogenic style is a part of my life now. I would never go back to stuffing my face in carbs and feeling so heavy and miserable. I wanted to share with you one of my favorite salads. It brings me a summerish fresh feeling. It’s effortless and fast to make. Homemade salad it’s a lot healthier and cheaper than the restaurant versions. I mean, you know exactly what ingredients you are putting in, but what’s more important is the quantity. So remember, in keto, to be healthy, the quality and quantity of the food matters the most. 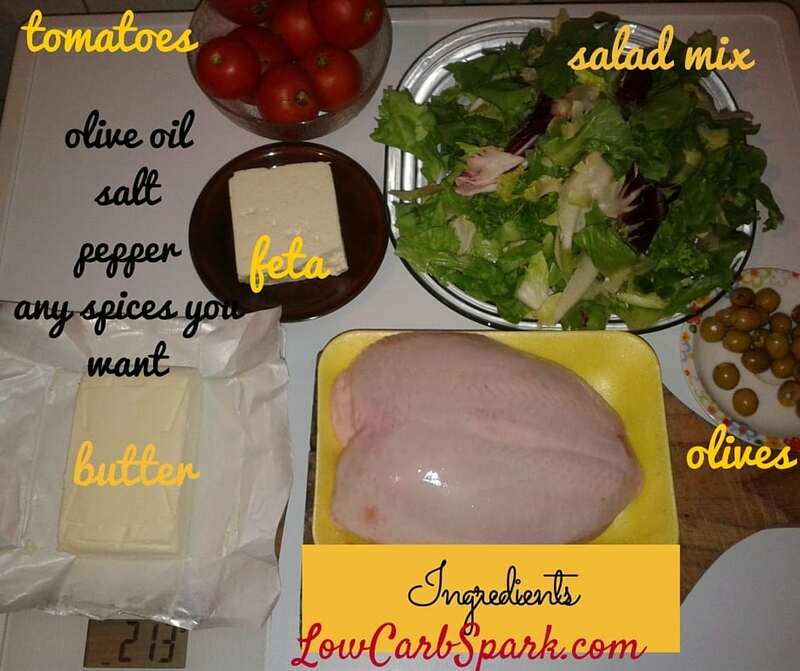 So, grab the ingredients and make my keto chicken salad. It’s delicious, super healthy and filling. You don’t have to be a master chef to cook healthy. You just have to care about your health. Make this change. One day you will see the difference. Try to eat salads as often as possible!! Stay away from the salad dressing you buy from the store. It might have a lot of ingredients that you can’t even pronounce, a lot of added sugar and plenty of health-harming chemicals. Go simple and homemade. 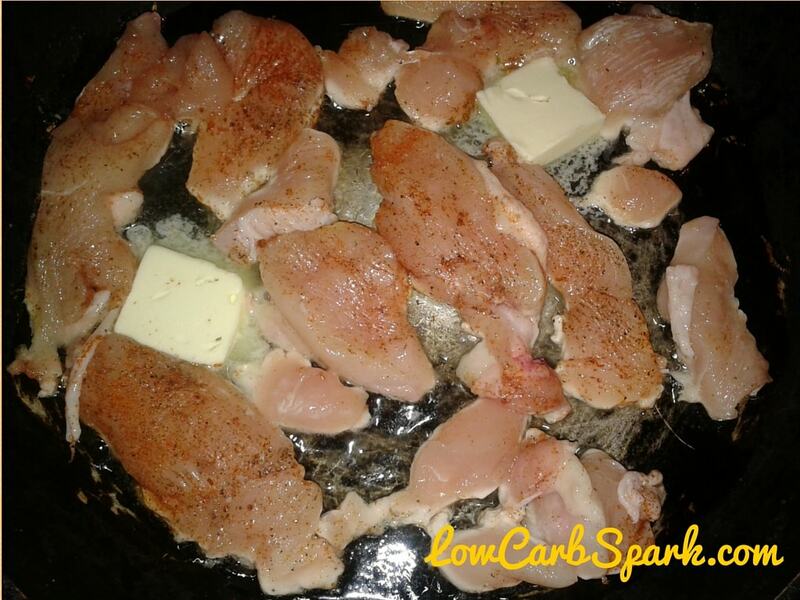 Step 1: Cut the chicken breast into small pieces (cubes). Then, season them salt, pepper and chili powder. Feel free to add any spices you want. Step 2: Put the chicken in a pan and add 1 tbsp of butter. Cook the chicken breast for 5 to 10 minutes until it gets nice and tender. Step 3: Place the cooked meat on a plate and let it cool. Step 4: Meanwhile, put the salad mix into a big bowl. Add 2 tbsp olive oil and mix well. Add the sliced tomatoes, the feta cheese, and some olives. Also, add some salt and pepper. 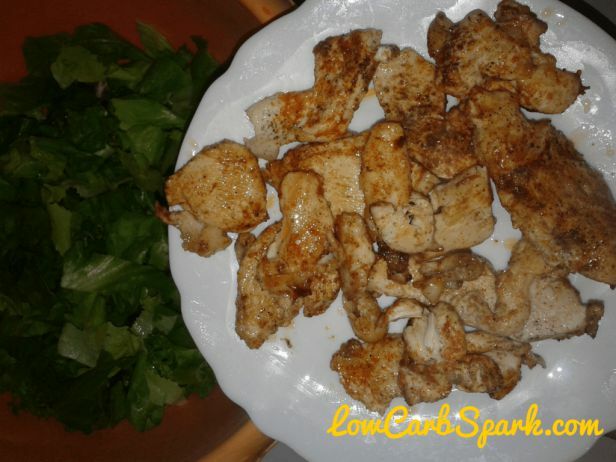 Add the cooled chicken breast to your delicious salad. If you tried this simple keto recipe let me know how it turned out. 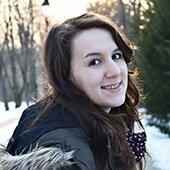 What is your favorite keto salad? 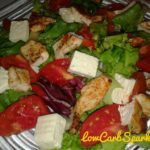 A simple and fresh keto chicken salad great for busy days. It has lots of healthy ingredients; it is super nutritious and low in carbs. Chicken breast provides high-quality protein, cheese is high in calcium, and the vegetables have a great amount of fiber and vitamins. With an extra drizzle of olive oil, you add healthy fats that keep you full for longer. Cut the chicken breast in small pieces (cubes). 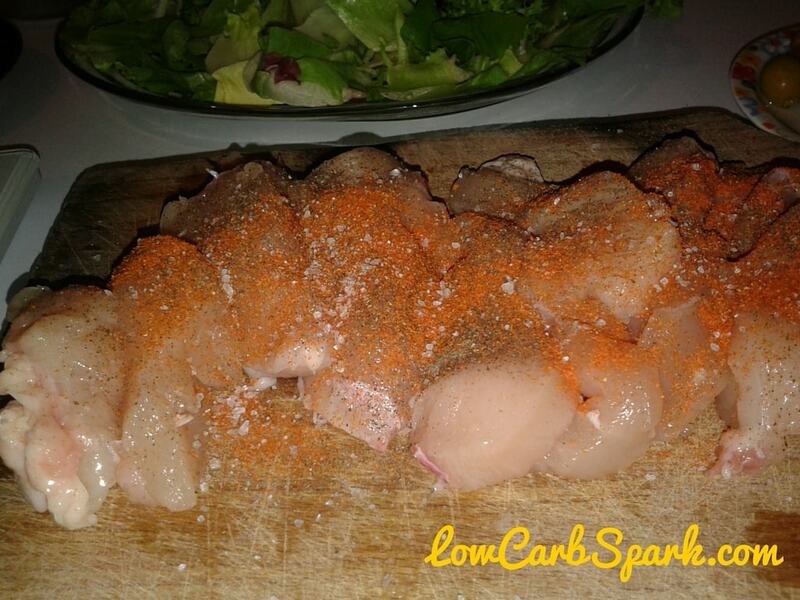 Season the chicken with salt, pepper and chili powder. Put the chicken in a pan and add 1 tbsp of butter. Cook the chicken breast for 5 to 10 minutes or until it gets nice and tender. Place the cooked meat into a plate and let it cool. Meanwhile, put the salad mix into a big bowl. Add 2 tbsp olive oil and mix well. Add the sliced tomatoes, the feta cheese and some olives. Also, add some salt and pepper. 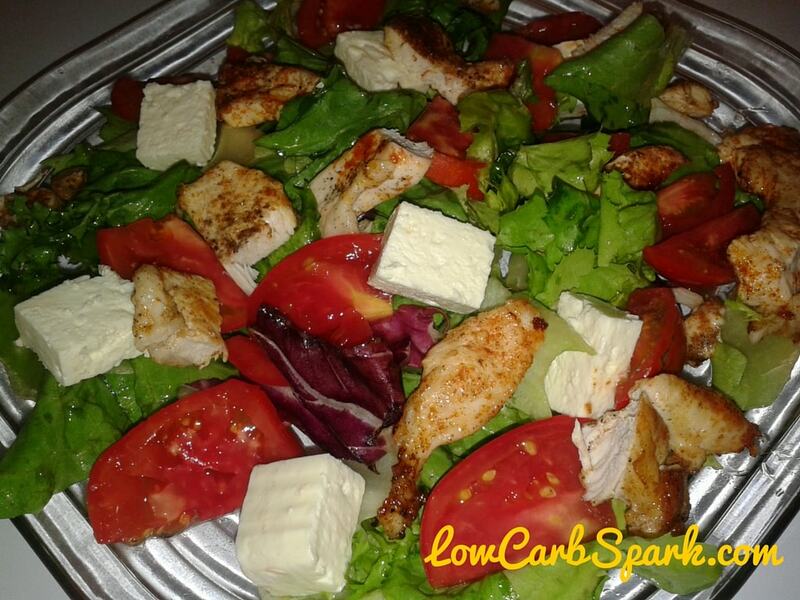 Add the cooled chicken breast into your delicious salad. 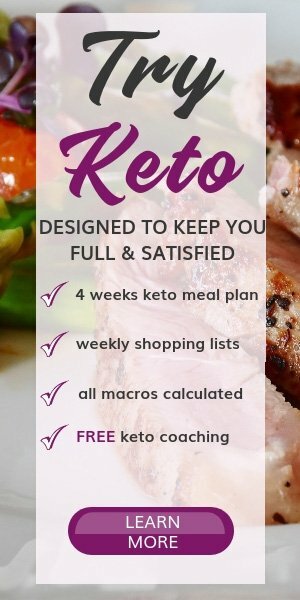 Low Carb Fruits Allowed on the Ketogenic Diet – The Complete GuideHow to make low carb skillet pizza in just 10 minutes?